After a nine month break I am back with the small stones and have started Kaspalita’s ‘Experience the world more deeply in seven days’. The twisting fronds on the sweet peas grip the stems of the plant’s own blooms and loop and weave around the fragile shoots that hold the fragrant heads. We cut the blue-rinsed flowers on stalks like the bent backs of old women; tired and frail. 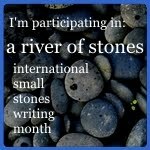 Today is the final day of the January A river of stones challenge and thanks to Fiona I don’t feel a failure for not managing to post up a ‘stone’ every day this month. I managed 15, which isn’t too bad and although some of them are pretty poor, there are a couple I think I could take somewhere. I have really been impressed with the contributions of some to the project and look forward to reading more when Fiona and Kaspa pull their collection together. It has definitely been a great challenge and as there will be another one in July I think anyone out there with ambitions to write poetry, or good prose, should sharpen their pencils and get practicing! Well we are encouraged not to think of a gap in entries as failure, but for me this lack of ‘stones’ is something of a disappointment. There have been days off before but five in a row is much longer than I hoped to go when I started this project. However, I have had a stressy piece of work to get done and a tax return so I must not be too hard on myself. Instead, I will endeavour to post one a day at least until I go away on the 27th and after that -well I have a notebook don’t I?! A creme egg nestles next a tub of blueberries/Parsnip soup unmade/How does the diet start tomorrow? Remember that other things are important too : ) Let go of that guilt and just start again. We have to go back and back and back and back…. well I know I do anyway! I like your blog a river of stones and the mental health blog as well specially the story from Chris. I think you found your way.